Sometimes we don’t realize what an impact the people in our lives have on us. In the last year I really has sat down and have taken stock of those who are fruitful and those who are not in my life. Even if there are people who have been around us for a long time sometimes we grow in different areas that no longer keep us connected the same way. You are in control of your life and can manage who is in your circle and who is not. There are those who bring positive and those who drain our energy with the negative. Then there are those who do anything to bring another person down; perhaps because they are not doing anything themselves. It’s your choice to weed out the people you no longer need around you. I know this is one of the most difficult things to do. I am not saying don’t ever speak to certain people again. If you still have a sense of value for someone but you know they are not bringing anything positive, limit your contact. It’s the other option. But sometimes the best way is to completely disconnect. The plaque in the photo above is pretty clear on how to handle things. 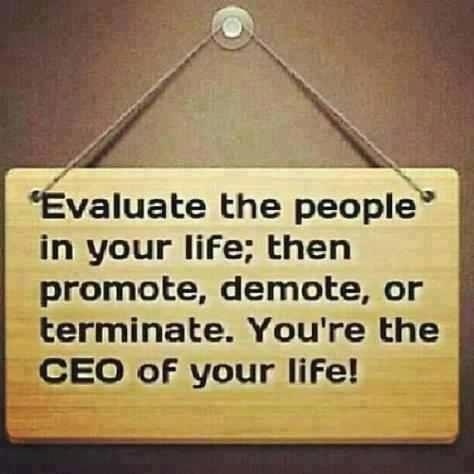 We are the CEO of our lives. We can choose who to hire, fire and keep.